The mission of A Look in the Book Ministries is to change lives by taking the whole Gospel to the entire world, particularly to the poor and needy. A look in the book ministries was founded by Pastor Timothy Wilbert in Aug 2007 as a outreach ministry of Bible Way Community Baptist Church. The mission of A Look in the book ministries is to glorify God by knowing God and making him known. The vision of look in the book ministries is to take the whole gospel to the whole world. 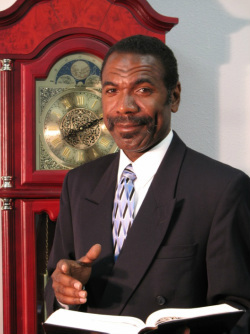 Pastor Wilbert is a native Mississippian, but has been living in the Dallas Fort Worth area for the past 31 years. Pastor Wilbert receive his B.S. degree from DeVry University He received his Master of Theology degree from Dallas Theological Seminary and has an earn Doctorate of Ministry from Southwestern Baptist Theological Seminary. Pastor Wilbert is a devoted man. He is first devoted to the Lord Jesus Christ, secondly devoted to his wife, Marion and their children, Timothy Jr. (daughter-in-law, Shalese) and Jonathan. Thirdly his calling pastoring and teaching. Look In The Book Ministries is listener supported. You can support A Look In The Book by either clicking the "Join Our Team" button and signing up to automatically give $10.00 per month or you can choose the amount you'd like to give A Look In The Book by clicking on the "Join the Team" button below. Thank you!